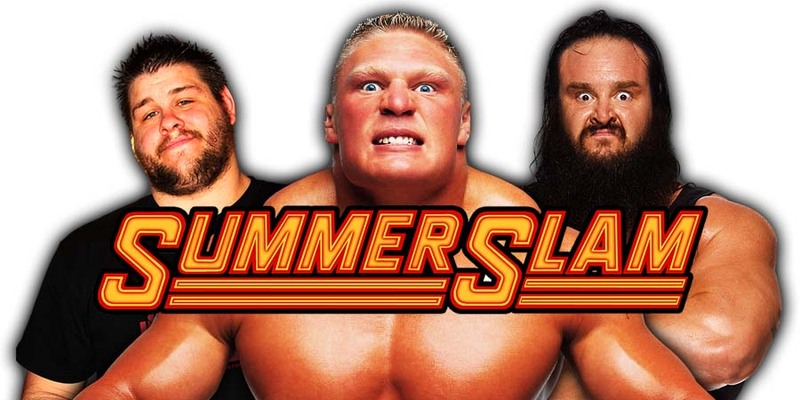 SummerSlam 2018 takes place this Sunday night and it will be WWE’s biggest event of the summer. In the main event of SummerSlam 2018, Brock Lesnar will defend the Universal Championship against Roman Reigns. This will be their 4th singles match together. Now let’s book this main event and the Universal Title scene. We are at SummerSlam 2018 and Braun Strowman is getting interviewed backstage ahead of his match with Kevin Owens. Strowman’s Money In The Bank contract is on the line in this match. Intercontinental Champion Dolph Ziggler and Drew McIntyre interrupt Braun Strowman’s interview backstage and McIntyre says a real champion like Ziggler should be interviewed and not Strowman, who will not be involved in a title match tonight. McIntyre’s comments anger Strowman and Strowman goes on to attack McIntyre. Strowman and McIntyre have a big fight backstage, but Dolph doesn’t get involved. Both men have to be separated by officials and now we head to the Intercontinental Title match.